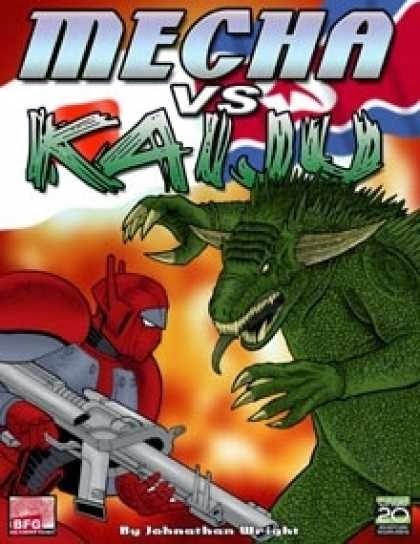 Back when True20 was still new there was a "campaign world" created for it; Mecha vs. Kaiju. It eventually spun off into a full blown product. I talked about it more recently when Pacific Rim came out. Well True20 sadly never got the traction it should have, but there is a new system to fill it's niche, Fate, and new Mecha vs. Kaiju for it. If it is anything like the True20 it will be ridiculously fun. Though it looks like to me this not a simple conversion, but a complete rewrite to fit the Fate rules. If that is the case then this stands to be a really, really fun game. If it does for Fate what it did for True20 in my mind then this is an easy winner. I have been dying to do something with Fate and this just might be the thing I need. The game is set up much like other True20 books. You have your three archetypes/characters (Adept, Expert, Warrior) and a host of new feats and powers to choose from. Some are campaign-specific but almost all could be used anywhere else. In fact there is enough here that the main feature of MvK is readily apparent; you don't have to do games about fighting giant monsters all the time. Now of course the main plot and thrust of this game is fighting giant monsters, but I can easily see some adventures of exploring monster islands, contests between cocky pilots, mad scientists, children with newly awakened psychic powers. When I first read this game my thoughts went first to Godzilla, but you can do Akira here as well and any number of other "Neo Tokyo" genres. Plus it is compatible with a host of True20 books I already have, so adding cyberpunk, horror or even comedy is easy. If you don't like the campaign background you can leave it, but I think you would be missing out on something really fun if you do. This might in fact be my favorite True20 setting. Thanks for the fabulous shout out, Tim! For those not familiar with Fate Core, it's a very open ended system that emphasizes player narrative. There are no classes, however I have introduced "Anime Archetypes" like the Big Guy or the Rebel, which give you new and interesting options. I'm glad you liked the setting, because that is what sets MvK apart from other giant robot or monster games. The MvK setting assumes that every giant monster movie ever made really happened, and gives players a chance to adventure during any period of the past 40 years. But at its core are the mecha and kaiju rules. MvK offers a design system that can be customized to fit your gaming group's interests. Want to just strap in and fight some baddies? You can design a mecha using Fate Aspects in 5 minutes. Want to give them more options? There are dozens of mecha and kaiju attacks and abilities. Want to get in depth with some serious giant robot simulation? There are options for that as well. Thanks again for being a long-time fan, Tim. You won't be disappointed.